An already challenging fitout project to turn an iconic Sydney landmark building into a threefloor Hog’s Breath Cafe became even more complicated as de-fit works started and complex, concealed structural issues were identified. Unperturbed by the new issues that had been identified, Aussie Fitouts relied on their professional team and veteran industry experience to tackle each issue head on tackle each issue head on. Hog’s Breath Cafe franchisee Mark Allen had an ambitious plan for his restaurant: Transform a beat-up building into a modern, well-built destination that looked as enticing as the food the establishment serves. He knew it was a challenge and began to scan the market for a fitout firm that would be not only be capable of constructing his restaurant vision but transform that vision into reality within a reasonable timeframe and budget estimate – and found a match in Aussie Fitouts. “We asked three builders to quote on the construction of our Brighton-le-sands restaurant. The most detailed – having factored in as many variables as possible – came from Aussie Fitouts. It was the only quote that convinced me that the builder understood the full scope of the works required,” says Allen. because of his positive experience working with the firm before. “The fact that they have also done four other restaurants and relocations for me in the last 6 years gave me additional confidence that they really knew what it takes to build a Hog’s Breath Cafe properly,” says Allen. was located literally on the beach. Concealed structural issues rose to the top of the firm’s list of priority concerns. “Right from the start due to limited ceiling space and structural supports we had to think outside the square and come up with a custom designed exhaust system for the cook line allowing the client to actually have their kitchen in the location they wanted,” says Jason Moden, General Manager at Aussie Fitouts. As the project progressed, Aussie Fitouts discovered further concealed structural issues, such as structural degradation that didn’t fit with the age of the building. “Even after accounting for the age of the building we weren’t expecting the extensive level of structural damage and instability which became evident once the de-fit of the existing fitout began. We identified very extensive concrete cancer in the overhead structural beams. Urgent and immediate rectification works to large areas of the upper level were required due to poor engineering structural work, previously done,” says Moden. The Aussie Fitouts team immediately installed temporary structural supports and sourced structural engineering solutions to allow the build to go on. They also had to install a platform lift up the main set of stairs which required removing sections of the upper level floor to comply with head heights regulation. When the team cut into the upper level slab, they identified the same outdated construction methods as used below which did not comply with updated industry standards. “We had to remove a large part of the slab and reinstate it to ensure compliance with current standards. This had a knock on effect on the other structural supports and footings that were to be undertaken. The project was constantly hampered by the age of the building which required constant rethinking and cutting edge solutions on our part. This is where having extensive experience in your team counts,” says Moden. If the stream of fresh structural issues were not enough to derail a project, Aussie Fitouts had other obstacles to contend with. Moden remembers how the lower level of the building is located below street level so it had a grease trap and pump out station that required upgrading. When the first summer storms arrived and the team was three quarters through the project, the existing roof and gutter system showed major failings and some needed replacing. The resultant storm damage destroyed parts of the work-in-progress which meant careful revisions of the project timeline to ensure the project remained on schedule. Aussie Fitouts drew on two strengths – structural solutions expertise and extensive industry experience – to complete the Hog’s Breath Cafe amid the crush of complications. The team worked closely with the structural engineers and their network of suppliers to change the building structure, and brainstorming sessions led to plans that overcame prevailing constrictions to achieve excellent outcomes for all parties. “To ensure that we had an outcome in the kitchen area that the client was going to be happy with we were constantly throwing up ideas and scenarios to our engineers to get them thinking outside the box to ensure that the client got what they wanted,” says Moden. Aussie Fitouts reconfigured the office layout and upper level dumb waiter food delivery area to make it workable from an operations point of view but in a much reduced space. This allowed them to allot more space, and construct a restaurant entrance and set of main stairs that looked polished and functional, and complied with building regulations and disability access laws. “We had to have an excavator inside the premises to dig out footings and due the fact the building is literally on the sand the footing had to be specially designed to take the load and not shift,” says Moden, adding that they used tonnes of concrete and steel with specialised treatment to make them last longer while being exposed to the nearby salt water. Moden believes preparation is the key to any project. Working on layouts, choosing the right materials with a focus on longevity for the clients investment is what they remember long after the project is finished. “All the structural issues above the kitchen and back of house areas had the engineers proposing solutions that were going to severely compromise the functionality of the kitchen. Building restaurants for over 20 years and having our own restaurant, we appreciate the ramifications of a busy restaurant with a kitchen that does not function effectively. Because of the long standing professional relationship we have with Hog’s Breath Café we were able to come up with an amended design that would allow for efficiency and productivity in the kitchen providing a positive solution for our client.” says Moden. The meticulous attention to detail and intensive collaboration with the client resulted in a breathtaking restaurant both inside and outside. Allen was thrilled with the result and impressed with the ability of Aussie Fitouts to adjust on the fly no matter what issue came up during the project duration. 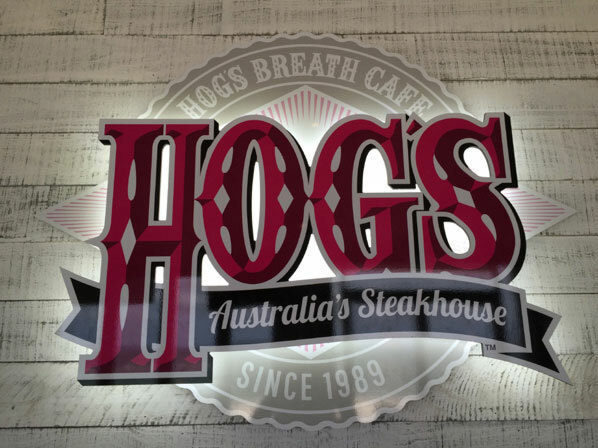 “Aussie Fitouts have a full understanding of all the complex issues surrounding building a Hog’s Breath Cafe. They have done it many times before, and deliver a well-built restaurant, in full collaboration with the client,” says Allen. “By being relentless in our drive for excellence and having a passion to provide our client with a restaurant, that not only looks fantastic but is functional and cost effective to manage, we successfully overcame several major hurdles along the way. By insisting that our engineers kept re-accessing at their solutions and stretching their boundaries to come up with a structural support system we were able to have a final solution we were happy with,” says Moden. “In the end we handed over an amazing looking ‘new look’ Hog’s Breath which has a kitchen that was as the client had intended, high quality, long lasting and functional without any compromises. They have an enticing entry and main stairwell that connects the two major areas of the restaurant that looks good and complies with the disability access code ensuring they can cater for anyone who wants to dine with them on all levels,” adds Moden. Aussie Fitouts is a proven industry leader with clients wanting a professional fitout which transforms their conceptual visions into reality. To review the original article click here.